What Are Tennis Retirement Rules? In tennis, occasionally a player may retire during the match to an injury and won't play any further part in the tennis competition. But does this mean your bet has been won/lost (depending on which player you bet on) or does this mean your bet has been voided? £10 back bet on Andy Murray to beat Rafa Nadal at odds of 2.5. This has a potential £15 winnings. £10 lay bet against Andy Murray to win. This has a potential £15 liability. Rafa Nadal wins the first set 6-3 but during the second set Rafa Nadal retires injury. On the exchange, because the first set was completed and Andy Murray has won due to Nadal's injury, you have lost your lay bet and paid out the £15 liability. On the bookmaker, the risk is that if you placed it on a bookmaker that only declares a winner if the match has been completed, then your £10 back bet is void, meaning you don't win anything! So overall, you have made a £15 loss. However, if you placed it on a bookmaker which has the same rules as the exchange, being a winner is declared if 1 set is completed, then you will receive your £15 winnings. Therefore, to be safe you should only use exchanges to lay bets when the bookmaker uses the '1 set completed' retirement rule to determine if the bet is won/lost or voided. Which Bookmakers Use Which Rules? Group 1 (All exchanges included here): All bets are valid if one set is complete. All of the exchanges are in this category so you are safe to back and lay. A whole set has to be completed for both back and lay bets to stand. If they haven't finished the first set and someone retires then all bets will be void and returned to you. If one set is complete and a player retires then your bets will stand. Group 2: All bets are valid only if the full match is complete. The full match has to take place for your bet to stand here. If there are any retirements before the match is over then your bet will be voided. This is why you can't back on a website in this group and lay off, because if your player retires in set 2, 3, 4 or 5 then your back bet will be voided, but you will lose your lay bet on the exchange. This group is exactly the same as group 2 however if a player is disqualified then bets will stand. This is an extremely rare occurrence and has only happened 6 times in majour tournaments from 1990 to 2017. So as you can see, you should only be backing and laying group 1 bookies. If you choose group 2 or 3 bookies then you need to be dutching them with a bookie in the same group. 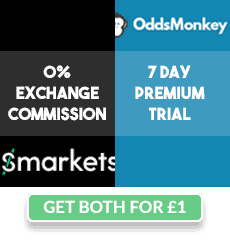 You can use Oddsmonkey's Dutch Matcher here to help you do this.